It includes 40 close-grip tweezers to remove short hair for up to 4 weeks of smooth skin. It includes a massage system to comfort the skin as you remove hair. It has a Smartlight so you can see the hair you want to remove as you remove it. It includes “Speed Personalization” which allows you to choose at what speed you want to remove your hair. It adapts to the contours of your body for closer hair removal. 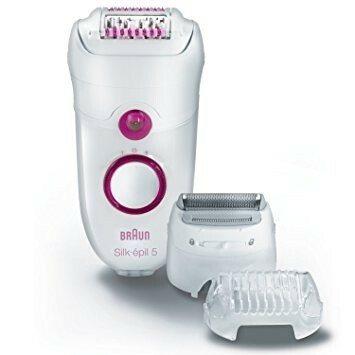 It has a shaver head that turns your epilator into an electric shaver. It is not cordless, so it is less convenient than some other hair removal products. Some users say it can be painful in removing your hair. It can be confusing to use at first if you haven’t used an epilator before. If you like the convenience and can put up with the discomfort of epilation then this is a good solid buy. Check out the other Braun in this set for the differences between the two.